Happy Friday! It’s been a long week my friends, but last night hosting the Ted Baker 25th Anniversary party was so much fun! Can’t wait to share photos with you on the blog next week, so stay tuned. Do you have anything fun planned for the weekend? Since I was super productive and social last weekend I feel like I kinda need to deflate this time, you know? I plan to lay out by the pool and grab dinner with some friends but basically just hang around and get some work done before my trip next week. Hope you all enjoy your weekend! Happy Friday to you too. I love your stripes and your red bag!!!! There’s honestly nothing I love more than stripes! Love those shoes too! -Ah I’m drawing a blank, but perhaps watch Midnight in Paris for some last minute inspiration? Can’t wait to see all of your pictures & reviews- I’m heading back in December! 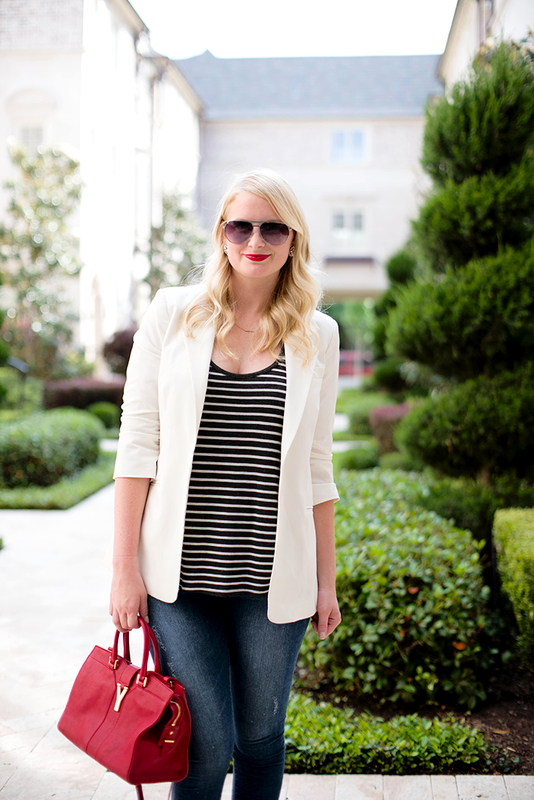 I will always love a look of a blazer with stripes….it’s perfect & so classic!!! Those red lips are rad too!! !